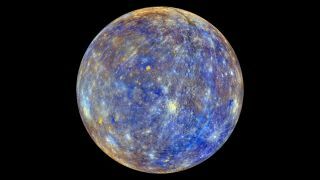 The early Earth absorbed a planetary body similar to Mercury (seen here in a NASA photo from the MESSENGER spacecraft), according to a new study in Nature released on April 15, 2015. The collision would explain the amounts of some elements in Earth's core and solve a mystery of Earth's magnetic field, scientists say. A key ingredient of the early Earth may have been a chunk of rock much like Mercury, scientists say. This finding could help explain how Earth's magnetic field has lasted for billions of years, researchers added. The meteorites that crash into Earth are usually thought to represent the building blocks that the planet grew from. However, Earth's crust and mantle puzzlingly have a higher proportion of the element samarium to the element neodymium than seen in most meteorites. New experiments now suggest that the addition of a sulfur-rich Mercury-like body to the early Earth could explain this anomaly. This research could also help solve another mystery — how the Earth's magnetic field has lasted for billions of years. "A Mercury-like body added to Earth during accretion would solve two important problems — that is, kill two birds with one stone," study co-author Bernard Wood, a geochemist at the University of Oxford in England, told Space.com. The researchers performed experiments with samples of material under conditions mimicking those at which Earth formed — temperatures between 2,550 and 3,000 degrees Fahrenheit (1,400 and 1,640 degrees Celsius) and pressures of 1.5 gigapascals. For comparison, 1 gigapascal is nearly 10 times greater than the pressure at the bottom of the Mariana Trench, the deepest part of the ocean. The samples of material the scientists tested contained traces of elements such as samarium, neodymium, and uranium. These elements are normally chemically attracted to silicate rock, which makes up most of the Earth's crust and mantle. They do not usually dissolve in iron sulfide, which makes up a significant fraction of Earth's outer core. The scientists found that if the early Earth incorporated a rocky body like Mercury, which is high in sulfur, this could make samarium and neodymium dissolve better in iron sulfide. This in turn would make samarium and neodymium more likely to sink down toward Earth's core. However, samarium is more attracted to silicate rock than neodymium is. This would have made samarium a bit less likely to sink downward, which could explain why there is a greater proportion of samarium to neodymium in Earth's crust and mantle. These experiments could also help solve a mystery concerning Earth's magnetic field. Prior research suggests that Earth has possessed a magnetic field for at least 3.5 billion years. Earth's magnetic field results from churning metal in the planet's outer core, but it was uncertain how Earth's core could have remained molten for so long. The new experiments revealed that if the early Earth engulfed a sulfur-rich Mercury-like body, uranium could have dissolved better in iron sulfide. This in turn would help uranium sink toward Earth's core. Uranium is a radioactive element that generates heat, which could have kept Earth's core molten. Wood and study lead author Anke Wohlers at the University of Oxford detailed their findings in the April 15 edition of the journal Nature.